Illegal fishing is a global challenge. By ignoring legislation, using illegal gear or selling undersized fish, 26 million tons of seafood, estimated at USD$23 billion, is extracted from the oceans each year. While huge international attention is given to illegal fishing in the marine sector, illegal fishing inland, by small-scale fisheries, is often forgotten. Lake Victoria is the second largest freshwater body in the world, bordered by Kenya, Tanzania and Uganda. Around one million tons of fish are caught from the lake each year, by around 200,000 fishers working from locally-made boats. It's widely believed that there are high levels of illegal fishing activity on and around the lake. This includes the use of nets with small mesh and illegal fishing gear to catch immature fish. Such fishing gear include monofilament nets, which are highly destructive if lost as they continue "fishing", and beach seines, which are small mesh size nets and therefore are indiscriminate in what they catch. In addition, illegal methods, like tycoon fishing to beat fish into the net, may be carried out near breeding areas. 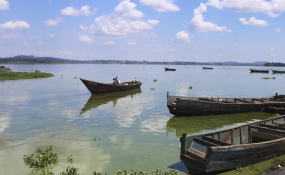 These methods threaten the sustainability of Lake Victoria's fisheries. Of particular concern is the Nile perch industry, the most valuable of the three commercial fisheries in the lake. The majority of the catch is exported, contributing greatly to government revenue and local economies. Stocks and catches of perch have reduced, from 340,000 tons in 1990 to about 251,000 in 2014. To address illegal fishing, a comanagement approach was introduced in the late 1990s. Many inland fisheries use this arrangement whereby local resource users, including fishers, traders and processors, work with government, and other actors, like NGOs, to manage fisheries. It's implemented in the hope that by involving the users of the resource, it will encourage more sustainable practices. It is also used when the state doesn't have the capacity to manage fisheries, including enforcing regulations, on its own. However, there's little evidence that the introduction of comanagement has led to a reduction in illegalities - and one of the reasons for this is corruption. We did research to find out how corruption affects the comanagement system of Lake Victoria fisheries. We were concerned that comanagement was said to be failing, as illegalities were still widespread, yet there was no link made between corruption and illegal fishing in lake management plans. We believed corruption to be systemic and strongly linked to illegal fishing practices. Our fears were confirmed. We found that it is a major enabler of illegalities; from paying a bribe to prevent gear from being seized, to receiving advance information on patrols from government officers to avoid arrest. By encouraging illegal fishing to continue, corruption is undermining the comanagement system. The lake's comanagement system is centred around 1,000 community-based beach management units, made up of all those that work in fisheries at a landing site - where fish is brought to shore. There are almost 1,500 landing sites, some are villages, others more temporary settlements. Beach management unit committees of between nine and 15 people are elected to work with government officers in registering fishers, gear, keeping landing sites clean and participating in patrols. For our research, we conducted 133 interviews with leaders from the beach management units, boat owners, boat crew, fish processors and traders and fisheries officers. These were done at six landing sites in each country bordering the lake - Kenya, Tanzania and Uganda. Respondents were not asked directly about corruption. Instead they were asked about their knowledge, and experience, of illegal fishing and many volunteered information about corruption. Our research confirmed that corruption exists and perpetuates illegal activity. It's part of the system and involves all stakeholder groups: fishers, fisheries officers, police and the judiciary. About half the boat owners and boat crew, though fewer fish processors and traders, referred to bribery and corruption when talking about their knowledge and experience of illegal fishing. They explained how enforcement officers demand bribes, rather than take offenders to court, or may arrange for regular payments in exchange for allowing the continued use of illegal gear. Given the prevalence of corruption within Kenya, Tanzania and Uganda, it would be ambitious to expect the fisheries sector to be immune from corruption. But recognising that corruption exists, that it encourages illegal behaviour and affects the management of the lake is imperative to putting an end to illegal fishing. Corruption affects co-management in at least three ways. Committee members become discouraged from enforcing regulations when enforcement officers, such as government fisheries staff and police officers, actively seek bribes and return seized gear. Cases were reported of government fisheries staff interfering in the election of committee members. Corruption among committee members made enforcement impossible and discouraged compliance amongst other fishers. There are also other incidents. For instance, politicians will intervene to stop enforcement during election periods. An example of this is when the Ugandan President, Yoweri Museveni, suspended the work of fisheries officers and beach management units during the last presidential election campaign. He claimed that corruption was rife. But no action was taken against anyone or measures adopted to prevent corruption linked to illegal activity and enforcement. Multiple measures would be needed to stop corruption within fisheries. These could be relatively simple, for instance ensuring fisheries departments do their job in a timely way -- licensing boats can take years whereas it should be done quickly and regularly. The issue of how fisheries staff are monitored and supervised could also be discussed. For example, staff shouldn't necessarily be in post at one location for a long time. Ultimately, the use of land and water patrols, fines and arrests to enforce regulations are futile unless corruption is recognised, openly discussed and measures taken to address it.